DOOM: A Brilliant Throwback to Classic Shooters 0 out of 5 based on 0 ratings. 0 user reviews. DOOM has gotten a lot of flak since beta about their multiplayer, but the single player and SnapMap features are where the game shines. I’ll admit, even I was not too excited about the new DOOM coming out when I played beta and found that the campaign was not co-op. Let me tell you, forget all you’ve heard and go play this game. Now. It is so much better than I could have imagined. If you’re someone who misses old, fast-paced shooters, you are in for a treat. The best part about DOOM by far is the gameplay. It is so fast and intense and fun that you could just play through the campaign multiple times for no other reason than to experience the combat. It has been a long time since I played a shooter with so much excitement and energy in their combat. Every fight feels like it is do or die and you need to be quick to take some of the enemies down. They do a good job at making sure you get the rush of playing a classic shooter like DOOM. There are also plenty of upgrades for your weapons and armor, though admittedly the armor ones don’t seem particularly useful in comparison. The graphics and game play style makes this feel like a modern game, but going back to the classic shooter roots with nothing but pure fun and adrenaline. It is a breath of fresh air in this otherwise saturated market. Another thing that’s great is the number of secrets and things to find in this game. Many of them can be hard, but that’s why their called secrets, they are supposed to be difficult to find. It is nice to have plenty of things to do in campaign since this is clearly this game’s biggest strength. I knew this feature had potential and it didn’t disappoint. 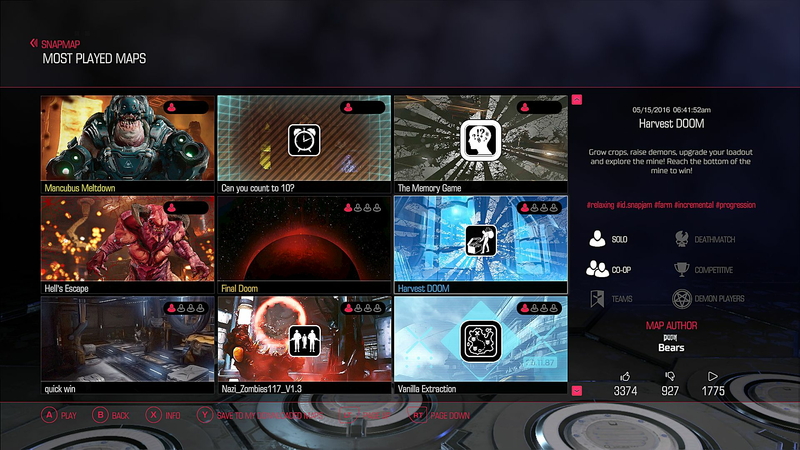 This is a feature that lets players create their own map and game modes. Although this has more to do with the communities creativity, the options provided by the developers are nearly limitless. I can see myself spending a lot of time just on SnapMap to see what kinds of things players can come up with. I played and interesting map that turned the game into a crop raising and adventure similar to Harvest Moon or Rune Factory. It was very creative how they went about it and the process of creating these maps are almost as fun as the maps themselves. Then there’s the co-op features, which are my favorite, so people can recreate anything they wan and allow up to 4-players to play it together. This may not be the same thing as playing the campaign on co-op, but it is a wonderful alternative. I wasn’t a fan of the beta, like many others, but I don’t think it is as bad as some people say. In general, they went with a classic feel, but it doesn’t offer the same fun and intensity as the campaign. Battles are fast-paced for sure, but many weapons are not needed when you can use the chaingun or super shotgun. The maps don’t seem too interesting either and i know it is DOOM and I don’t expect to see a forest or water region, but it just feels bland inside the multiplayer maps. There are plenty of cosmetic option to unlock, which is always great, and the demon gameplay is definitely fun, but it just doesn’t hold my interest like the campaign and SnapMap does. Holy crap the load times are long in DOOM. This isn’t what I had in mind when I wanted to return to older gaming. The good this is once you are in the levels, most of the time, you won’t have to load much unless you go into a Rune Trial. When you do load though, it is so long that you are prompted to press continue since even they know that you probably went off to make a sandwich, take a shower, and do a bit of light reading. At least it is worth the wait. DOOM is a very fun game that fans of shooter and DOOM in general will greatly enjoy. These games aren’t usually my style but even I had a lot of fun and can appreciate how great of a game it can be. If you are looking for a change and miss classic shooters, do yourself a huge favor and don’t pass on this potential game of the year.